It’s the holidays and you’re supposed to be enjoying yourself! Problem is, you’re reading all these blogs about how fattening eggnog is, so you’ll have to borrow Santa’s pants after the string of holiday soirees you’ve got lined up. Which Is Healthier: Hot Chocolate or Eggnog? Today, I’d like to bring you a little good cheer, to tell you about three holiday foods that might actually help you lose weight. Cue: Little Drummer Boy… Drumroll, please. Holiday Weight-Loss Wonder #1: Pistachios. Various studies show that people who eat nuts tend to be leaner than those who don’t, and a recent Harvard study revealed that nuts are a top food for driving weight loss. Read the full list: Top 5 Foods for Weight Loss (and 5 That Make You Gain). 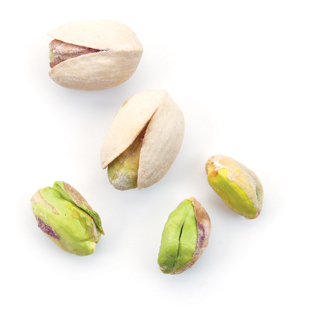 Pistachios, in particular, are a great choice: a 1-ounce serving (157 calories) contains a generous 49 nuts. The ones you have to shell yourself are even better, as removing the shells slows you down and seeing evidence of what you’ve eaten may prevent you from reaching in for more. In a recent study out of Eastern Illinois University, people who were given unshelled pistachios consumed 41 percent fewer calories than those offered nuts with the shells already removed. Holiday Weight-Loss Wonder #2: Wine. A 2010 study in the Archives of Internal Medicine found that, over nearly 13 years, women who consumed light to moderate amounts of alcohol gained less weight and were less likely to become overweight. One theory: women may sip a glass of wine in place of a high-cal dessert. Holiday Weight-Loss Wonder #3: Chocolate: If it’s something sweet you prefer, go for it, straight away. Savoring a small treat each day won’t sabotage your weight-loss efforts, says new research in the Journal of the American Dietetic Association. Keep your treat to about 150 calories—that’s about two squares of dark chocolate, for instance—and make room for those calories by cutting back elsewhere.